In the latest issue of Utne Reader, founder Eric Utne speculates on how we are affected by the stories we tell. He notes that from the 1930s through the 1960s, our national story telling focused on success and hope, even in hard times like the Depression and World War II. Now, our stories (including video games) are “chaotic, post apocalyptic scenarios in which the human condition is, in the words of Thomas Hobbes, ‘solitary, poor, nasty, brutish, and short.’” Utne suggests we need to find a way to tell stories that will let us rebuild what is broken. Too often, job seekers fall into the trap of telling themselves the wrong kind of story. Everything we hear in the media is negative: high unemployment rates, wage cuts, layoffs, jobs sent to other countries, and technology making people irrelevant. It’s easy to fall into despair. The alternative is to rewrite the script. Where do you want to be? How can you get there? Don’t focus on what’s wrong. Think about your goal and how you will achieve it. The next step is to turn the story into a plan and follow that plan with dedication. Will the path be easy? No, it never is. Anything worth having takes work, struggle, patience, and faith. Those are the core elements of the story you need to tell, the story of a career (and life) in which you are in control. After moving to Chicago in 1986, I became a Cubs fan. The team’s long time rival, the St. Louis Cardinals won the World Series this week. Many of my friends who are Cub fans can’t root for St. Louis. Generally speaking, I wouldn’t either. This year’s Cardinal team, however, deserves respect and admiration. During spring training, the Cardinals lost their top starting pitcher, Adam Wainwright, to injury. Chris Carpenter, the #2 starter, got off to a very slow start and only finished the year with 11 wins to 9 losses. Over the course of the year, they used several pitchers as their closer. In the middle of the year, they traded Colby Rasmus, a top prospect, and went to a platoon in center field. They ended the year with a second base platoon of cast offs Ryan Theriot and Nick Punto. For most teams, such a year would not lead to a World Series championship. The team’s first great achievement was making the playoffs. They were almost unbeatable from the middle August through September. Even so, the Atlanta Braves seemed to have the Wild Card locked up. Then everything changed. The Braves couldn’t win while the Cardinals could not lose. The reward for making the playoffs? A first round match up with the team experts called the best in baseball, the Philadelphia Phillies. The Phillies have the best pitching in the game, maybe one of the greatest staffs in history. Somehow, the Cardinals got over that high hurdle and went on to beat the Milwaukee Brewers, which set up their championship match up with the Texas Rangers. The Rangers were in last year’s World Series and had improved an already strong roster. Texas went up in the Series 3-2, and had a 2 run lead going into the 9th inning of game six. Things seemed dark for the Cardinals. The Rangers’ reliable closer Naftali Feliz was on the mound. Somehow, the Cardinals tied the game and took it into the tenth inning. In the top of the inning, Rangers’ star Josh Hamilton hit a 2 run home run. Again, the Cardinals needed a miracle and got it, scoring two runs for another tie. In the bottom of the 11th, David Freese, the Series MVP, hit a home run to seal one of the greatest comebacks in the history of the game. The seventh game couldn’t have started worse for the Cardinals. Chris Carpenter gave up two runs in the first and had a rocky second. After that, he settled down, and his team won the final game by a score of 6-2 in a final come from behind effort. The best sports stories end with the underdog winning, David beating Goliath This year the Cardinals played that role. They never quit or lost faith in themselves. This team embodied what it really means to be a winner. I’d recommend no more than 6-7 sentences for a thank you letter. First, thank the company and mention the position. Second, speak to the interviewer’s concern. Three, ask to move forward and say you want the job. What about format? Handwritten or email? I think email works if you take the time to craft a good letter. Some people that I greatly respect insist that handwritten is the only way to go. If you want to take the time and make the effort to send a handwritten note, be sure you do so the same day you interview. Here’s a good trick for learning what matters most to an interviewer. Most interviewers will let you ask questions. Your last question should be: “What is the most important quality you are looking for in a [sales manager]?” If the interviewer says someone who can build a team, briefly affirm why you are a team builder. If she says somebody who hits the number, talk about how you meet/exceed goals. Next, when you’re writing your thank you letter, come back to this point and again affirm that you can deliver the most important quality. Don’t send generic thank you letters. They only say I don’t care. Speak to the person who interviewed you and show that you care about her biggest concern. That will be the best way to make an impression. The Occupy Oakland group has plenty of reasons to be upset. Police and other law enforcement agencies have attacked the group to the point of using tear gas and stun grenades. Earlier this week, an Iraqi War vet Scott Olsen was severely injured. In response to this action, the group has made a bold and possibly dangerous call for a general strike on Wednesday, November 2. General strikes require critical mass. While the Occupy Oakland groups have been large, they are not large enough to shut down a city. If they go through with the strike and it fails, it will give politicians and the media one more stick to club this brave movement. On the other hand, if the movement can shut down the city, then the government will brand them as thugs and possibly terrorists. We might even see more extreme actions by the police, which they would justify in the name of public safety. I cheer the Occupiers’ spirit, but question the tactics. This movement will be strong only as long as it stays peaceful and persistent. So far, it has been a beacon in a dark time. May the light shine on. Postscript: According to the LA Times, 4,500-10,000 protesters rallyed at the port of Oakland. Earlier in the day, large protest took place. I don't know if it was a great "general strike." But it showed that this movement has power. Three cheers to the brave occupiers of Oakland. It’s a story I’ve heard again and again. “Why don’t they get back to you?” Many clients get so aggravated and feel so mistreated that they stop applying for jobs. That’s a big mistake. You don’t want someone to call or email just to say they don’t want to hire you. That game is lost. Keep playing. Rather than ask why someone’s not calling, find the company that wants you to work for them, the company that needs your skills. Don’t wait for the phone to ring. Stay in the game and keep playing hard until the phone rings. Forget the rejection, stewing in it just makes you miserable. Look for the employer who wants you. That’s when you’ll win. Last week, I was very busy helping customers, which makes me happy and grateful. What makes me unhappy is bad telemarketing calls that interrupt me while I’m trying to understand what a customer needs. Don’t get me wrong. I’ve dealt with many professional telemarketers. They understand when you’re with a customer and quickly offer to call you back. Bad telemarketers and prerecorded calls don’t care. They keep talking until irate customer like me hang up. They also cost American jobs. Many telemarketing and customer service jobs have been off-shored to countries where workers are paid 19th century wages. Over the weekend, I was dealing with a very pleasant off-shored customer service representative. However, he could not understand what I was saying. I had to spell my name and give my address twice in order to receive a refund. Similarly, recorded telemarketing calls make prospective customers listen to the end of the message to press a “off the list.” key. It’s a waste of time. What if local workers were managing the phones? I believe the customer would get a better experience, and the company trying to market its products or service its customers would be more like to keep customers happy. So why do companies offshore and automate? Bigger profits. The old methods were profitable, but the low salary worker and the machine bring home even more margin. What do they lose? Customers. What is their biggest cost? American jobs. I’ve always loved history, the stories of great leaders, political movements, wars, science, and invention. Living in Chicago, the city where the skyscraper was born and so many great architects practiced (and still practice) their craft, I’ve gained an appreciation for a different way of understanding the past. 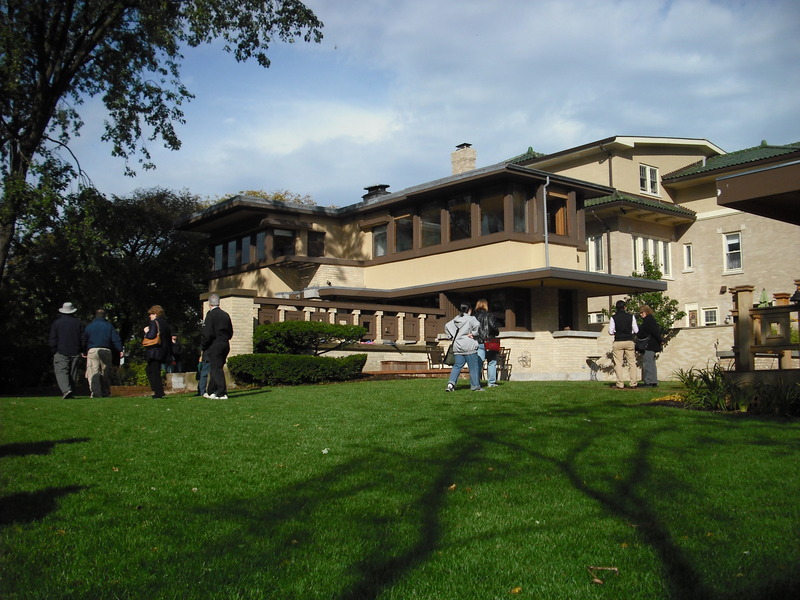 Last weekend The Chicago Architecture Foundation held an “open house” in different city neighborhoods. I went with a group of friends to explore Rogers Park and West Ridge. Next door to the Bach House is a home that was built four years later in 1919. For most of its history, it was a large single family home. 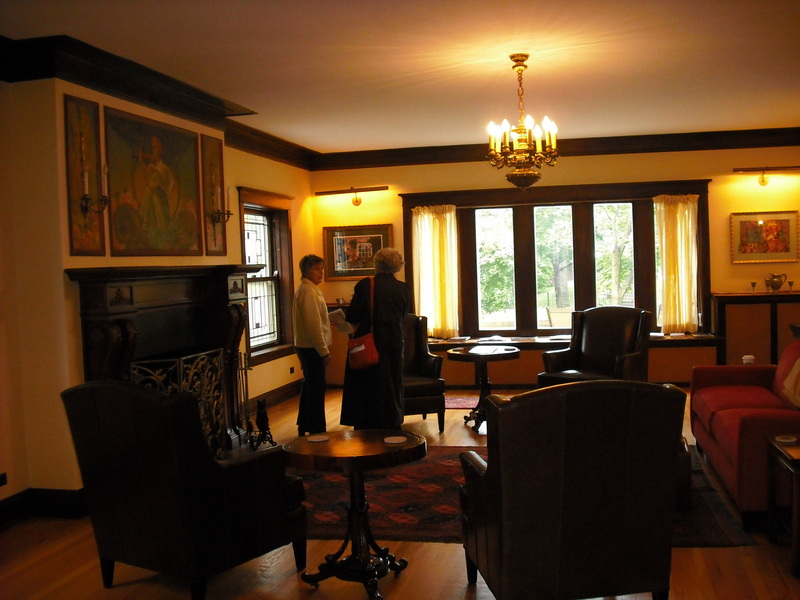 Two years ago, it was rehabbed and reopened as Cat’s Cradle Bed and Breakfast. The new owners have added several bed and bath rooms while retaining the building’s historic feel. 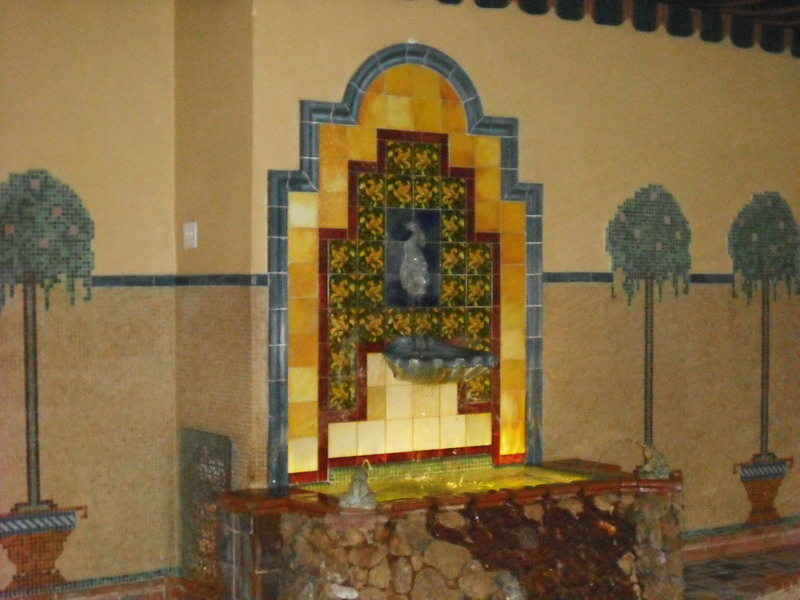 We headed west to a large condominium building called Casa Bonita, which was built in the 1920s. 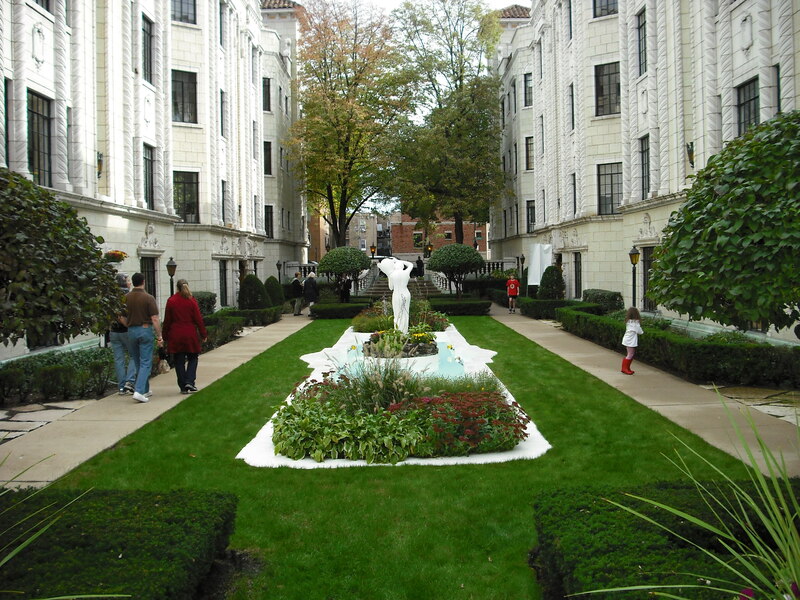 There are many courtyard buildings in Rogers Park and West Ridge, but few have the lavish features of this building. We were led on the tour by a resident who has lived in the building for more than 20 years. 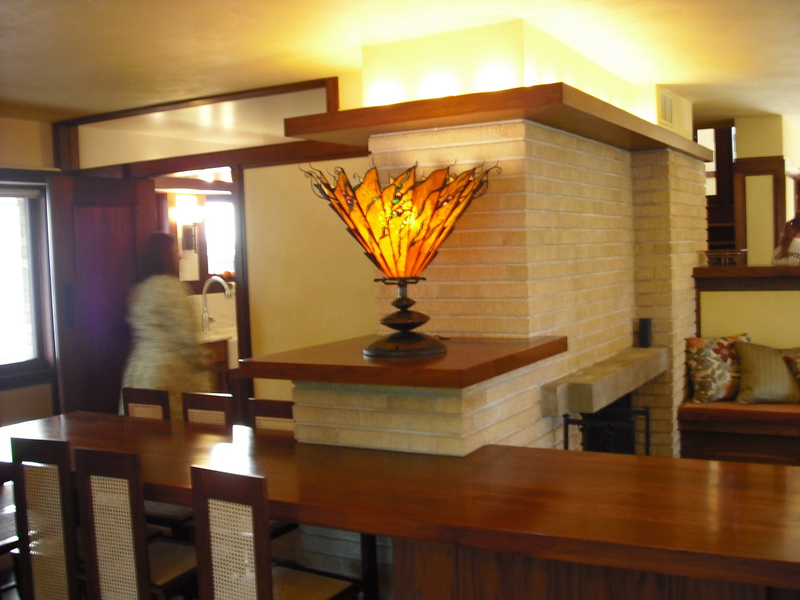 She told us about several changes in the building and efforts that have been made to maintain its original appearance. Further west, near Indian Boundary Park, we visited the Park Castle, a condo building which was also built in the late 1920s. 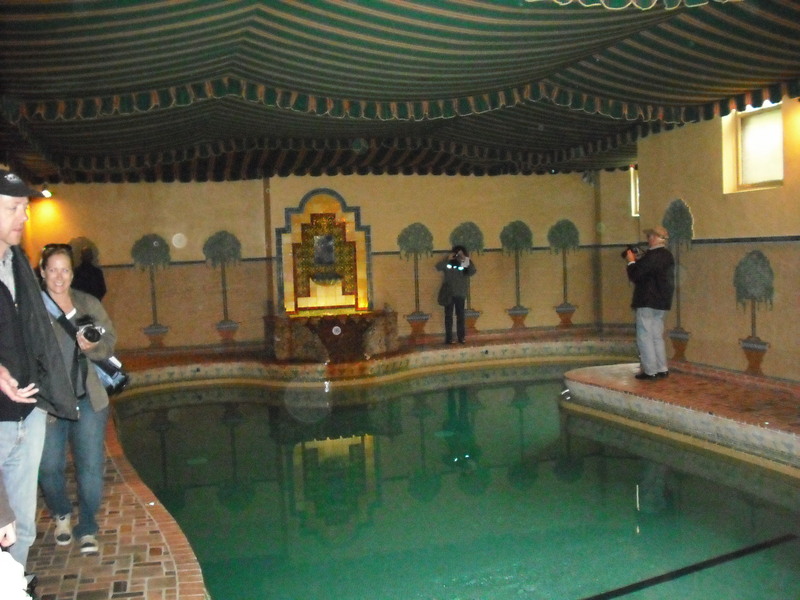 It has a pool for residents that is decorated with ornate tile and a fountain. We ended our tour at two theaters: Lifeline and Mayne Stage. Lifeline Theatre is now 30 years old, and it is located in an old electrical power station. During the tour, we were shown how different areas have been remade into rehearsal space and a craft shop where sets are built. Mayne Stage is located in a building which was opened as the Morse Theater in 1912. From the 1960s through the 1990s, the space was transformed several times, serving, among other things, as a synagogue and a shoe repair shop. Now it is a state of the art theater and restaurant (Act One). I love to learn about the history of buildings, how they change function and take on new lives. They are a testament to skill of the architects and designers who make our world a better and more interesting place to live. Open House Chicago was enlightening and great fun. I hope the Chicago Architecture Foundation repeats and expands this brilliant concept in coming years. In today’s post, Seth Godin considers a very important distinction between managers and leaders. What I take from this post is that a manager will ask you to do more faster (productivity). The leader will challenge you to do something better and give you the tools you need to change the job (creativity, what Godin defines as a linchpin). If possible, work for a leader. Better still, be a leader. College graduates are facing one of the worst job markets in history. Many are questioning the value of their education and degrees. I don’t deny the difficulty. Some of my clients who are recent graduates have been on the market for several months. The road is difficult, but not impossible. Two clients have had recent success that is worth noting. One client who majored in accounting with a specialty in agriculture has an offer from a large agriculture processing company inIndiana. Another client has completed interviews with a leading retail chain and will probably get an offer for a management training program. Both of these clients were persistent in applying for jobs and networking whenever possible. Most importantly, they did not quit in the face of a tough job market. There is no easy answer, especially in this economy. But don’t believe the headlines with doomsday statistics. Don’t let bad news stop your job search. Individual success is possible – you are not a statistic. What is Falling Faster than Jobs? Pay.